Billionaire Democratic donor Tom Steyer helped finance a company used by the family of China’s former head of state to park investments in overseas tax havens, leaked corporate documents reveal. Steyer’s hedge fund joined a firm with ties to the family of China’s then-premier in an early investment round for a British Virgin Islands-based company, according to incorporation documents on file with a Singaporean corporate law and accounting firm at the center of a global scandal over opaque financial flows. The documents shed light on the activities Steyer engaged in to earn his estimated $1.6 billion fortune, but that run counter to many political principles and causes he is now using that fortune to support. Steyer is the single largest individual donor of the 2016 election cycle to Democrat-aligned outside spending groups. 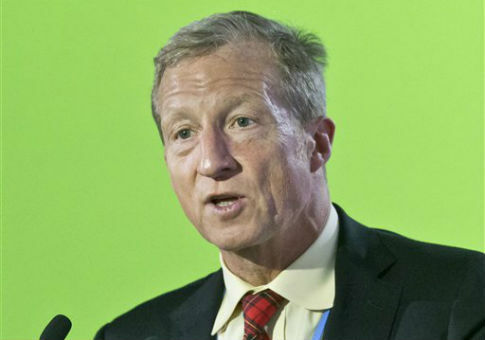 Before committing full-time to his political operation—undertaken primarily through NextGen Climate Action, the super PAC that Steyer funds almost single-handedly—he led the successful hedge fund Farallon Capital. Steyer founded Farallon in 1987 and led it until 2012. His immense personal fortune remains invested partly in Farallon funds, and nonprofit groups run by Steyer and his wife continue to draw income from the firm. Farallon joined big names in finance like Goldman Sachs and venture capital firm Sequoia Capital in the first round of funding for a Chinese billboard advertising company called Skyflying Media in 2008. However, the money didn’t go directly to China. Instead, four Farallon funds invested in a company called EMarket Holding Group Corp., according to information leaked to the International Consortium of Investigative Journalists. Skyflying existed on paper as EMarket, which operated in China and Hong Kong but was incorporated in the British Virgin Islands. Another investor in the deal had a lower public profile than Farallon or Goldman. The firm New Horizon Capital also participated in Skyflying Media’s funding round by way of EMarket, according to ICIJ data and contemporaneous press statements. The Hong Kong-based private equity firm was co-founded in 2005 by Wen Yunsong, the son of then-Chinese Premier Wen Jiabao. The investigative journalism consortium identified New Horizon’s other co-founder, Yu Jianming, as a director of EMarket. According to a 2012 New York Times report, Yu "helps control a string of investment vehicles tied to the Wen family." Wen Yunsong stepped back from day-to-day operations at New Horizon in 2010 after Hong Kong regulators ruled that the firm’s late-stage investment in a drug company violated rules governing initial public offerings. The younger Wen reportedly retains a financial stake in New Horizon despite his diminished operational role. When New Horizon and Farallon invested in Skyflying Media, both he and Steyer remained actively involved with their investment firms. Farallon and New Horizon’s backing of the company was revealed in a massive leak of offshore corporate registration information that ICIJ dubbed "Offshore Leaks." The project was a predecessor to the Panama Papers leak last month, which revealed additional details about efforts by the world’s wealthiest and most powerful people to hide their assets in offshore tax havens. The Offshore Leaks project exposed thousands of companies incorporated by the Singaporean legal and accounting firm Portcullis TrustNet. EMarket was one of those companies. "The main product that TrustNet sells can be summarized in one word—secrecy," ICIJ wrote in the rollout of its Offshore Leaks release. "The firm helps ensure names, finances, business interests and political links remain hidden. It does this using a variety of methods, such as creating maze-like layers of companies and financial trusts in multiple countries and in many cases helping clients open overseas bank accounts in the names of anonymous companies rather than in their own names." Information in ICIJ’s Offshore Leaks and Panama Papers has also drawn recriminations in the United States, where politicians such as Hillary Clinton—for whom Steyer has raised money—have blasted corporate efforts to hide assets in offshore tax havens. Powerful Chinese individuals pervade the documents in the Panama Papers and Offshore Leaks projects. The Chinese communist party has stepped up its domestic censorship campaign in an effort to reduce the fallout for top government officials implicated in the leaks. The Times’ 2012 report on the Wen family’s finances revealed additional ties to New Horizon. According to the report, Yu was a legal representative for Chinese industrial equipment manufacturer Xuanda, which was itself an investor in New Horizon funds. Xuanda investors include Wen’s brother-in-law, Zhang Jiankun; Zhang Yuhong, a vice president at an investment firm run by Wen’s brother; and Wang Zhuangli, "a shareholder in several Wen family-related companies" and a former employee of the state-owned diamond company then run by Wen’s wife. Xiaosong "Jonathan" Zhang, Skyflying’s former chief financial officer, left the same year as Wen Yunsong. He joined Chinese technology firm iSoftStone, which was financed by a state-owned financial services company. It received millions in Chinese government subsidies with Zhang as its CFO. Farallon under Steyer was very active in China, particularly in the country’s energy sector. It launched a spinoff venture capital fund in the country in 2009. Farallon also struck deals in parts of the world that benefitted from the political connections of the firm’s co-investors, such as the former Soviet Union of the mid-1990s. Farallon’s EMarket deal was well timed. Two months after Farallon invested in the company, Skyflying formed a joint venture with the German-listed company Business Media China, which saw potential to boost advertising sales ahead of the Beijing Olympics that summer. Spokespeople for Farallon and NextGen did not respond to requests for comment about this story. This entry was posted in Issues and tagged Taxes, Tom Steyer, Transparency. Bookmark the permalink.